The 1878 Variel Home was built by one of the first emigrants to pass through American Valley. Joshua and Mary Variel made the long, arduous journey from Indiana across the plains and over Beckwourth Pass in 1852. Pausing long enough to refresh their animals, Joshua noted in his diary, "Here we obtained some fine vegetables." The family continued on to Camptonville, Yuba County, where Joshua practiced law until 1878. In that year the family moved to Quincy where Joshua and his son Will built this home on Coburn Street. Restoration work in 1990 uncovered a board with a message from the past: "Framed by Will Variel Oct. 31st, 1878." View a photo gallery of the 1878 Variel Home. The Variels sold the home in 1896 to Sheriff John Bransford who then added a two-story porch and made other alterations. Attorney Louis N. Peter, an Indian Valley native, purchased the home in 1899 and made major renovations, including an entire three story addition that has since been razed. Mr. Peter died suddenly in the home in 1916. 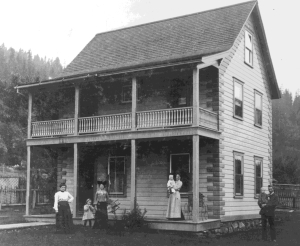 Abe and Emily Bar bought the home in 1922 from the widowed Mrs. Peter and remodeled it still more. For years they rented rooms to high school students from remote parts of the county. Later, their son Lewis ran an insurance business from the home. Following three more owners, the Plumas County Museum Association Inc. purchased the property in 1989 and began the laborious process of restoring the home to its late 19th century appearance. View the inside of the home. After more than seven years and countless volunteer hours, the home was formally dedicated July 14, 1996. It is owned and operated by the Plumas County Museum Association, a non-profit organization dedicated to the preservation of Plumas County history. Donations are welcomed and are tax deductible. 1878 Variel Home is open on weekends and by appointment in the summer. If you have any questions or would like more information on docent-guided tours, please call (530) 283-6320 from 9:00 am to 5:00 pm, Tuesday through Saturday.